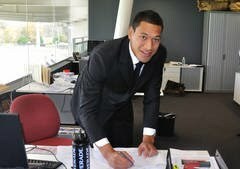 Israel Folau has signed a four year deal with the West Sydney Wombats (or Team GWS if you lack imagination) who enter the AFL Competition in 2012. A Rugby League player - Israel Folau is just 21 years old and has already won a premiership with the Melbourne Storm in 2007 and played both State of Origin Football for Queensland and Internationals for Australia - so you can't argue that he technically has anything left to achieve in Rugby League. Apart from perhaps - capitalise on his immense talent for the game. At the Team GWS Press Conference at Blacktown Olympic Park today, you could have been forgiven for thinking Folau was reading from the same cue card when he answered every question. In fact so overused were the terms 'Excited', 'Challenge' & 'Opportunity' that anyone seeing a replay of the Press Conference could entertain themselves with a riveting game of Key Word Bingo. In short, Folau spoke of - "the excitement I have for the challenge that the opportunity to play AFL presents"... etc etc etc. There's no doubt he's interested in testing himself in a new code but sadly he did utter the immortal line regarding money when he said "money wasn't the end factor in my decision." Team GWS Coach Kevin Sheedy was up front about the reasons the Wombats' signed Folau and you can't fault the new club's desire to make their entry into the AFL work. But Sheedy did sound a tad optimistic when he said Folau - "May get to love AFL". There was one set of questions from the Male Model from Mudgee (Channel 9's Ken Sutcliffe) that lacked tact and resulted in Folau having words put into his mouth by Team GWS CEO Dale Holmes - both of which were unfortunate and avoidable. Sutcliffe was hardly polite in how he asked a similar question posed here on wdnicolson.blogspot.com earlier today regarding Geelong champion Gary Ablett Jr.
We wondered if Ablett could now ask for twice as much from Gold Coast FC - but Sutcliffe basically made Folau out to be the symbol of everything that is wrong with codes stealing each other's players. He prattled on about the kids who play AFL and learn the game feeling robbed of what they could earn now that Folau is getting $1 million with no AFL experience. But Sutcliffe is missing the point: if Folau wants to play AFL - that's his call Kenny my boy - you're not entitled to vent your frustration over another Rugby League player defecting and use that as a reason to rip the kid apart. 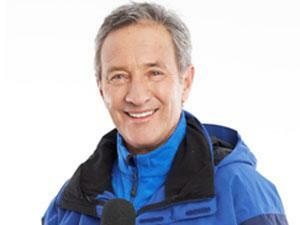 Especially when he's doing exactly what you'd do if Channel 7 doubled your salary and asked you to do the weather. For the record Folau's answer was smart - "I can't comment on that (what Ablett is thinking)" and Sutcliffe shouldn't be surprised if Folau doesn't give him a one on one interview in the future as a result. Currently a member of the Brisbane Broncos, Israel Folau's departure has been felt hard by the club. In a statement on broncos.com.au Broncos chief executive Bruno Cullen said:"It is sad to see Israel make this move but we understand the unprecedented inducement that was offered. We wish him all the best for the future after this season. And now this matter is resolved the Broncos and Israel can move on and concentrate on the task at hand - that of making the finals of the 2010 NRL competition." They might wish him all the best but you can bet they thought that signing Ben Hannant last week might have convinced Folau to stick with the Broncos - as the club sought to reclaim their status as a competition powerhouse. But it is not to be. Folau will get upwards of $6 million for 4 years of 'development' at the West Sydney Wombats. Which begs the question - how does the AFL's best player Gary Ablett Jr feel about a 21 year old Leaguey getting more $$$ than Ablett would get by staying with Geelong? Surely the Gold Coast should be offering Ablett $2 million a season now - if Karmichael Hunt & Folau are on $1m each. Current Head Coach of the AFL's AIS Academy Jason McCartney told the Sydney Morning Herald (The SMH has some great coverage on the Israel Folau Signing here) that Folau had run an AFL Skills Drill for him in April and Folau had shown McCartney he had "phenomenal hands" amongst other skills that would translate well into AFL. He did however indicate that when it came to Folau's kicking "there was nothing dramatically wrong with it." Mmm... last time anyone checked kicking was the biggest part of AFL. And the Wombats are going to pay someone over $1 million a season to learn how to kick... maybe Ricky Ponting should throw away the cricket bat and show the Wombats his own 'phenomenal hands' and start living what had to be a boyhood dream of playing AFL at the elite level. In fact Ponting is probably a better kick than Folau as it is. That being said - Israel Folau might be a great AFL player. He also might never be seen in the code past the first six months of his contract - such is the fickle nature of professional sporting contracts these days. There is no doubt Folau has oodles of natural sporting ability. He's probably one of those guys everyone hates and admires because no matter what form of sport he's playing with his mates - he's the best at it. But what he'll quickly find out in AFL is that his opposition will be fitter, faster and more skilled than him from Day 1. Folau might have superior hands and a good vertical leap but he's never been a strong defender in league (fellow convert Karmichael Hunt was a good defender in League and will bring that technique to AFL with the Gold Coast) and he will have to learn one skill that League would never prepare him for - positional awareness. Well the AFL types will have a pet name for it but basically if you've ever played a game of AFL in your life the biggest adjustment to any other football code is the speed at which the game moves - all over the field. While it is a structured game - the game moves at a pace that demands that every player know where their direct opponent is, where the ball is and where the ball might go. This level of awareness (while constantly moving) is something Israel Folau has never experienced playing in the outside backs in Rugby League. While it is often said that Centre is the toughest position in Rugby League to defend at - the fact is the ball doesn't ping around the Rugby League field like it does in AFL. As a result Folau can switch on and switch off in a game of League - or for a harsher term... float. That's just the nature of the game of Rugby League - outside backs can switch off at different stages of the game and it doesn't hurt their team. Folau switches on when he needs to and the results are often incredible - but in AFL while you might look at any given match and say 'oh a full forward only needs to pay attention when the ball is over halfway' - you'd be wrong. The game of AFL demands that every player buy into their coaching staff's system and if that means endless runs off the ball simply to tire your defender or spread the field in anticipation for four or five possessions ahead of where the ball is now - then you do it. One thing an AFL player should never be seen doing by his coach (or his club's fans for that matter) is standing still or loafing during a game. Israel Folau is one special talent but at age 21 he must unlearn the 'loaf' and dial up his intensity levels to an astronomical degree. Otherwise the AFL will chew him up and spit him out very very quickly. His position may well be as a marking forward but as mentioned above it is clear his kicking needs a lot of work. Mind you it isn't all bad for Israel Folau... he'll get a payout of monumental proportions if it doesn't work out in AFL and then he'll sign a $300,000-$400,000 a year deal with an NRL club and be welcomed back with open arms. Whether that is in 2011, 2012, 2013 or beyond - that's up to Israel Folau. Here's hoping he can stick with AFL and make a successful (and like Karmichael Hunt a groundbreaking) transition from Rugby League - but it certainly won't be easy. And we haven't even touched on the impact Folau's signing will have on the propaganda machine that Kevin Sheedy is fine tuning for the West Sydney Wombats entry into the AFL in 2012. But having said that - will Israel Folau still be in AFL by then? One final note on the West Sydney Wombats... or Team GWS as they remain for the time being. On the Team GWS Site they have narrowed the field down to four names for their entry in 2012. They are - The Giants, The Rangers, The Warriors or The Wolves. But seriously how can any of those Americanised names truly compete with the mighty West Sydney WOMBATS! AFL will need to do more than sign izzy to get GWS to work. I feel they will only cannibalise their own share of AFL in Sydney!